It’s the most romantic time of year, right? If you’re on the hunt for some extra date night ideas that are affordable and out of the box- this post is for you! A night (or day) out with my husband is one of my favorite things in the world, and we are always on the hunt for new ideas to keep things fresh and exciting! I don’t mean the movie theater obviously- haha!- I’m talking about a live theatre performance. I LOVE going to musicals, and when Cody is in the right mood, he will indulge me. It’s more of a unique experience than just going to a movie, and my favorite part is that you can dress up much more for these! :) This little pink dress is just perfect for a fancy date or as a wedding guest option. It runs VERY small- I sized up two sizes for reference! This is one of our favorite date night options because let’s face it- a nice dinner out can be super expensive. Especially if you want to order a drinks, appetizers, dessert, etc. Have an early dinner at home then go somewhere intimate for drinks and/or share a dessert. This sassy look would be my outfit of choice for a drink with my hubs. Do we all just die over these hot pink heels?! Major heart eyes! This can either be buying actual tickets to a band you like or something more spontaneous like just going to one of your favorite dives that typically have live music. I find this to sometimes be more romantic/intimate than just dinner- bonus points if there is also some dancing involved! :) This top is open-backed and is so pretty on! I saved my personal favorite for last. We legitimately do both of these things pretty regularly, and it makes us soo happy! We’re basically just big kids. Haha. But there are some for real perks of doing this outside of just rekindling some childlike whimsy- like the fact that NO ONE else is ever doing it so you can basically have free reign of the place in the evenings. 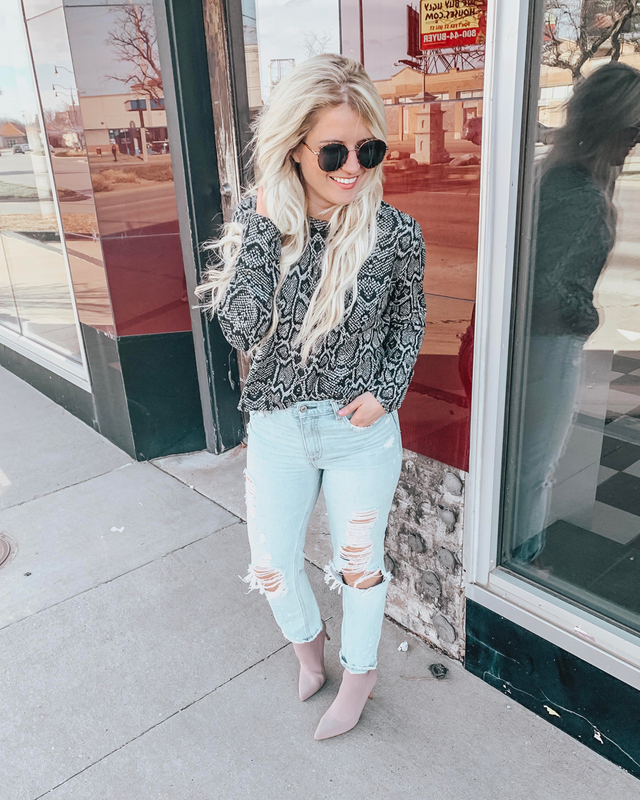 ;) This sweater is my most casual option and will definitely get the most wear time out of all of the outfits! It’s super comfy and fits true to size. Hope you all feel inspired to plan some fun date nights with your person! You can check out the video below for more date night outfit inspiration!